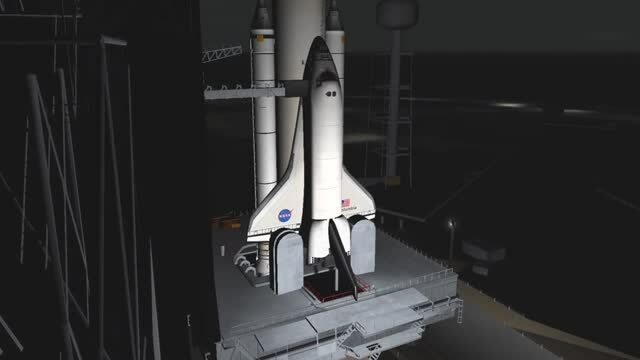 Space Shuttle Mission 2007 is the newest and most exciting Space Shuttle Simulator available today, designed to provide the experience and excitement of the NASA Space Shuttle missions in extreme detail. High-Resolution TrueEarthâ„¢ Global Satellite Imagery licensed from TerraMetrics Inc. These are the same textures used by Google Earth. Watch the countdown and Shuttle Launch from the place that few get to see it: the VIP spot at KSC. Experience the Liftoff shakes and engines roar right from the Commander's or Pilot's seats. Perform mission procedures: press buttons, rotate knobs, control and change General Purpose Computer modes and manually guide the Shuttle to a safe landing etc. First Person View, including EVA you cannot get any closer to the ISS or Hubble than that! Third Person View and Free Camera View throughout the missions watch the Space Shuttle and any space object from angles that even Astronauts never got to see. Launch Control, Mission Control, Shuttle and Astronauts audio communications. Three difficulty modes: from Novice which leads the "astronaut" through the tasks with context arrows and full text subtitles, to "Read the Manual and Checklists Commander!" Documentation: "Quick Start" and "Commander's Reference Manual". Variable-difficulty historical missions from STS-1 (the maiden flight) and up to the recent ones. Expandable: we periodically release new missions and features, enhancing playability and sim life. Native support for Vuzix iWear VR920 Stereoscopic goggles + head tracking. This is the closest you can get to the NASA VR Labs where Shuttle Astronauts train for ISS missions. The archive SSM2007.zip has 14 files and directories contained within it. Having always enjoyed the world of flight simulation, being able to take in parts of the world I wanted to see but never would be able to, I have found myself growing a little bit tired of visiting the same places over and over again. However, there are many mods out there that change this due to the fact they add in something a little bit fresher than usual – in this brilliant add-on, I was able to finally take myself away from the same areas and actually head into space instead. Space is something that most of us will never even get close to being near, so it’s amazing to get out into the space above the planet and see it all from a whole new level of detail and realism. The first thing I noticed upon installation, though, was the massive attention to detail and design within all space-related craft. From the shuttle itself to the large space station and accompanying equipment like satellites, I was easily able to understand what I was looking at. The fact that the shuttle cockpit has been rendered and made so effective, using 3D special sound effects to help add to that atmosphere even more, makes it a lot easier for people to just relax and get used to being within a whole new kind of aircraft. Everything from the little countdown to takeoff features that have been added, right down to the liftoff as it shakes and roars its way through the skies into a whole new part of the flight simulation experience. Instead of stopping mid-way through the skies and not being able to ascend any higher, I was able to rip through old barriers and carry on beyond the world. Whether it was using First Person viewpoints or Third Person, I was able to get a truly amazing view of the world around me as I flew. In fact, the views and angles that come up truly give you a balance and scope as to just how vast the actual world is – with an amazing model provided to show you the real scale and detail of our planet below, you’ll get to witness from truly breathtaking scenes. I was drawn to this package because it offers such incredibly realistic detail on everything from the shuttles to space itself; these are the little features that make things stand out in the world, and this is why I deem to be most important when using a simulator. The missions provided via the Control Center are hugely enjoyable, too, making it really easy for you to undertake more than a basic flight around the place to see what is going on. Instead, with this, you get to enjoy the sheer wonder and class of the space around us by having something to do. Other space flight mods might exist but I’ve yet to find one with such an attention to detail in both the design as well as the tasks to take part in. If, like me, you want to witness the space world like it’s never been seen before in a flight simulator then this is the place to get started. -I tried to download and run the Demo ---it downloaded and installed ok but I could not get it to run.